Styles by Jenece | Denver-Based International Hair/Makeup & Wardrobe Stylist | Fashion: Hair ribbons and tinsel and feathers - stick to the trends! Fashion: Hair ribbons and tinsel and feathers – stick to the trends! August 2011 – Jenece is featured in the Boulder Daily Camera. To view the original article, this link will open in a new window. My poor daughter. She has her mama’s hair. How do I know this, when she’s only 17-months-old, you might ask? Because sometimes while combing her hair, I discover things. Lost rubber bands, forsaken bows, twigs. You never know what you’ll find, just embedded in the under-under-layer. Grass? But we haven’t been to the park in three days, and we’ve washed her hair twice. No matter. Hair like ours does not function under the standard laws of logic. Wash it and it gets dirtier. Comb it and it gets rattier. Bettie Anne’s locks are a lost treasure chest of curly chaos. A deep-sea octopus that grabs on to things — that is floats past and hides them deep in its embrace — until some brave voyager cuts them loose. That’s because when you have the thickest, sweatiest, curliest, weirdest hair that belongs only on a musk ox, it is not uncommon for live animals to build nests in it. A week after an updo and three washings later, I found a lost bobby bin. Come New Year’s Eve and you might find packaging tape, tinsel and several small jingle bells caught in the curls. Lucky for me, that’s cool now. Hair tinsel. And seeing as it’s only August, I probably still have some left in there from Christmas. This whole pinning-junk-in-your-hair fad really has me (and Bettie) feeling hip. You’ve seen the feathers, attached to the hair with a metal clasp, glue, pins. Or (in my case) via a bird flying above and, like a projecting frog tongue, your hair plucks a feather mid-flight. According to stylist Jenece Amella (stylesbyjenece.com), the avian look kicked off this spring when singer Steven Tyler rocked it on American Idol (even though I’ve been accidentally rocking it for 30 years). Feathers can last as long as two months, and you can wash and curl hair as usual, she says. Young adults and teens: Go for brighter colors to add a bit more flair, Amella says. Mid-20s through grandmothers and brides tend to opt for more natural, earthy ones. Strands can cost between $5-$20 each. As for hair tinsel, it’s tied into the hair using a square knot and can last two to six weeks, Amella says. It’s often cheaper than feathers, from $2-$5 per strand, and can also be washed and styled as usual. 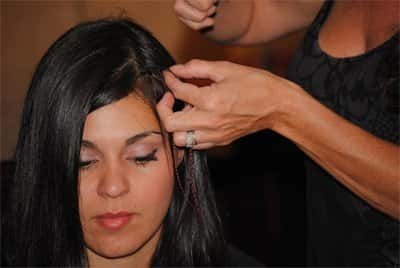 Look for tinsel at select salons (like Fix Hair Salon in Boulder), beauty supply stores, like Sally’s, and online at hairflairs.com. Amella says the tinsel is just now taking off, and she expects it to be big in Colorado around the holidays. I’m hoping by next spring, some Hollywood star makes twigs, branches and hair key chains popular. Then when Bettie goes to preschool, she can look like a trendsetter instead of a scruffy hair pirate. Lace, stripes and embellished denim, according to Bohme Boutique. Tribal, tribal and tribal, according to the Buckle. More specifically, Indian-inspired, feathers, orange and brown and fringe. Flare-leg jeans, animal prints and sequined layers, according to Express. Jeggings (with some new fabric called “gummy denim”), oversized sweaters and graphic tees, according to the Gap. Necklaces, tanks, denim and layers, according to Nordstrom. Denim, denim and denim, from flare to skinny, accord to Old Navy. For children, military style with embroidered and studded insignias, bronze, buttons, double-breasted jackets and cargo pants, according to Naartjie.